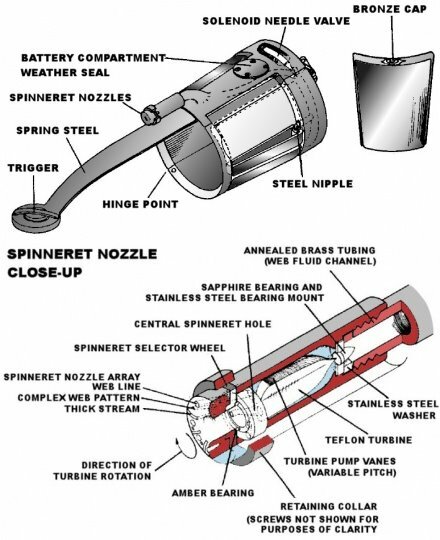 Spider-man's web-shooters explained - Biological webbings or Artificial device? 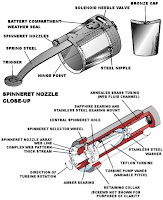 | Insights into movies, music, top songs, pop culture: Spider-man's web-shooters explained - Biological webbings or Artificial device? 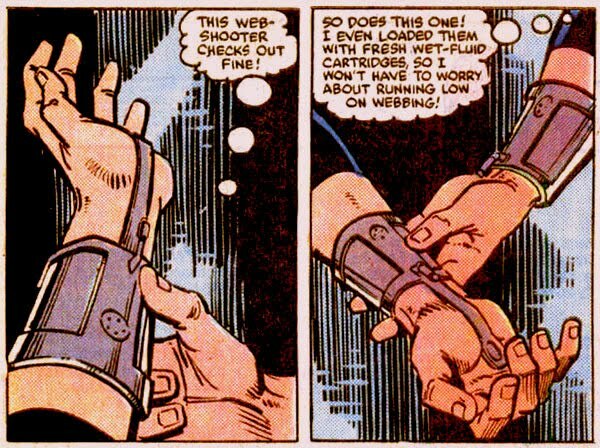 Vern recently raised this question - Should Spider-man have biological webbings built into his wrists or is it better if he used some artificial web-shooter devices attached to his wrist for shooting those webbings? For those who have no idea what's going on, lemme give you some background - As we all know, Peter Parker became Spider-man after getting bitten from an irradiated spider. What if Peter Parker bites someone, by the way, I've always wondered...but anyway, in the original storyline, Peter Parker COULD NOT shoot webbings from his wrists. Instead, he had to use a device (that he invented himself, being a huge nerd and a brilliant scientist), to shoot the webs. Later on, though, he develops spinnerets or something in his wrists that allow him to shoot similar webs directly from inside his wrists. excluded the transition from artificial web-shooters to organic web-shooters arc, people feel sufficiently strongly about it to the extent that some fans have taken trouble to try to create actual real life designs for those mechanical web-shooters. I guess the only missing ingredient here are the super strong, super sticky and auto-disposable webbings, that Peter Parker (or in some versions his father) was able to invent and then periodically replace because of him being a super genius high school scientist. But what does this transition from artificial web-shooters to organic webbings tell us? I mean aside from the expected difficult to resolve plot issues like "how does he pay for the raw material for the webbings" and "why is he keeping this useful technology to create almost unbreakable strings to himself?" and as Vern observed "why is he Spider-man when he doesn't have the very basic power associated with spiders" etc....aside from these and other issues, what is the subtext here? Before we try to understand what it means for Spider-man to use artificial devices for shooting webs, let's explore the character of Peter Parker a bit. The original Peter Parker is an over-exaggerated version of your typical nerd who spends most of his time studying sciences and doing experiments and sh-t. He is a teenager so obviously he also wants to hook up with girls, but being a huge nerd with thick glasses doesn't really help him there, so he's a little frustrated as well. 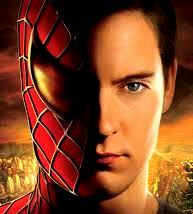 Now, all of a sudden, he gains superhuman powers because of a freak accident and he decides to use those powers to enhance his self-esteem and escape the real world by playing a superhero. He spends his time doing this and not becoming the local wrestling or soccer superstar also emphasizes his debilitating nerdiness, but the fact that he goes completely out of the way to design those artificial web-shooters, drive this point home - He is still a huge nerd at heart and spends all his resources working on devices that let him shoot strings from his wrists! Now we notice the obvious problem with this character - It's just way too close to the sad reality! It makes nerds feel stupid and non-nerds can't relate to him. Basically, most superheroes are a nerd's dream come true - "If I had super-strength, no one could bully me" or "If I could read minds, I'd know what she thinks about me" or "If I was funny/likeable kungfu master, everyone would respect me" etc. But, with the exception of Batman who is technically a psycho, none of the other superheroes go out of their way spending time on gadgets unless they *really* need them (Ironman, for example, needs the suit for life support). But we know that your typical next door nerd can spend hours and hours playing games or hacking a computer or reading comics or any other activity that keeps him busy and away from society. And, with the introduction of artificial web-shooters, Peter Parker ends up that guy! A reader shouldn't wonder why Peter Parker is wasting his time experimenting web-shooting devices instead of going out with Mary Jane, that's something that should just go unsaid. It's too close to reality and too sad. How we really want the readers to relate to Peter Parker is in terms of our own daily struggle of doing what we personally want to do vs doing what society tells us to do....or doing what is fun vs doing what we need to do.....or eating a big bag of cheerios with beers and chicken wings vs eating oatmeal and salad everyday.....or simply making difficult choices doing the right thing vs slacking off and doing whatever we crave for....or however else you want to put it. This is a character that everyone can relate to because he is living the same life in the same world with the same restrictions that we do. He has superpowers but he still needs to make everyday decisions that decide where his life is going to go. Spider-man juggling his "duties/responsibilities" with his romantic life gives us comfort and strength (in a way). Further, we relate to him without feeling bad about ourselves because he is not an anti-social geek anymore, he doesn't waste his time working on unnecessary devices. Rather, he is so short on time dealing with "real life" that he barely manages to have fun, if any at all. Peter Parker is finally a nerd that not only makes nerds feel good about themselves, but a nerd who even non-nerds can understand. Spider-man finally feels like one of us dealing with similar life issues that we deal with, and the transition from artificial web-shooters to biological web-shooters makes it all possible! You contradicted yourself a little there in the middle, but onto my real point, this was a very biased article more explaining your own opinion than anything else. The biological webbing was a creation of the movies, so why then has the character been popular for several decades before the films if he wasn't relatable, the same goes for Batman, and his now six, soon to be seven, blockbuster films. 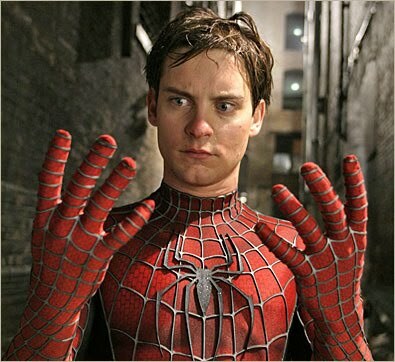 i respect your apinion but i dont get why just because he make his own web shooters it means peaople will feel bad about there life?